After many years of few changes in the old mask and snorkel setup, this is an interesting innovation. It just won the 2014 Oxylane Innovation Award (I have no idea what that is, but I suspect it’s just the first of many awards for this contraption). The French company Tribord has come up with a way to allow snorkelers to breathe by both mouth and nose and without fogging the mask, as well as allowing diving without water entering the snorkel at all. Living room on wheels designed by Italian designer Mario Bellini in 1972 as a collaboration for Citroen and Pirelli. It’s a combination conversation pit/sleeping area. 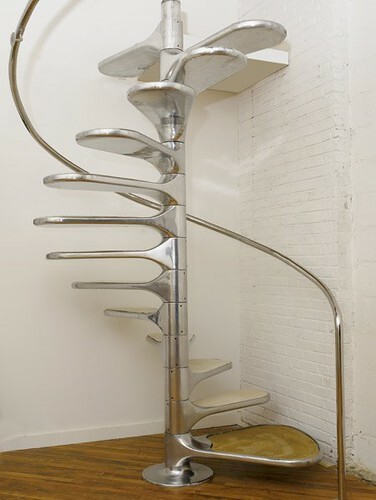 It was introduced to the US later that year in a show at MoMA – Italy: The New Domestic Landscape. We’re so bloody sombre now. Tags: car, Citroen, green, industrial design, Italian design, Italy, Italy: The New Domestic Landscape, Kar-a-Sutra, Mario Bellini, MoMA, tone on tone, vehicle, why are things so boring now? 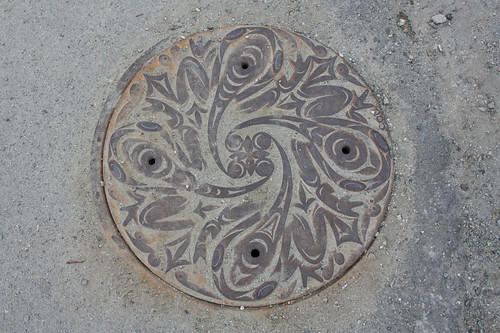 Storm sewer cover by Coast Salish (Musqueam) artist Susan Point and her daughter Kelly Cannell, depicting four small eggs in the centre, spinning out to tadpoles that become frogs radiating out to the edges. Point is a Vancouver-based Coast Salish artist and master carver whose work has been commissioned for the Vancouver International Airport, the University of British Columbia Museum of Anthropology and the Smithsonian in Washington.